﻿ Corruption to its greatest. Involved Users: Me and the accused staff members. Time/Date/Time Zone: Not sure not needed that much either. Abuse of Power or Rule Infringement: Eeee394 abused his powers by falsy denying my UBR and lied in the courthouse. Tomo additionally lied about rules of the courthouse and made up excuses to keep me from getting unbanned. Almost a month ago I decided to make an un-ban request, attempting to explain my self and try getting unbanned. Narcotic showing once again his amazing ability to take decisions after making me wait for a few days went on and denied my UBR giving me no second chance to reply although I even asked for it. After seeing my UBR I thought of contacting a SA as I saw no reason for my UBR being rushed that much. So I went on and contacted Tomo. After having a chat with Tomo and explaining why I thought it should be re-opened he agreed with me and asked Narcotic to re-open my unban request. However, as it can be seen neither before or after the re-opening of my unban requested there were no questions asked or any further information requested. 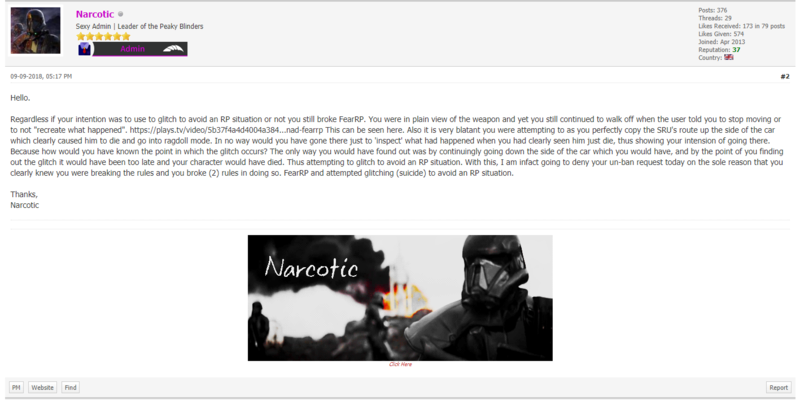 after my explanation as to why it should be accepted and my valid points of proving that there was nowhere any information requested by Narcotic, he proceeded to say that the rule for some reason gets overpowered. Tomo not wanting to be known as the SA that lets UBR's get accepted by rule 6c made biased decisions. Both him and Eeee394 kept accusing me of loopholing while I was just going along the rules set by Soulripper for ALL of us to follow and they were doing the opposite. which is pure lying as there were 0 questions asked on Narcotics reply. he then proceeded to block me. To conclude both SA's have acted very biased and immaturely regarding my situation, Tomo admitted himself that rule 6 did apply and then changed it up so he could keep me banned, Eeee394 could not handle having an adults conversation and had to block me and generally act immaturely. I don't see how this kind of behaviour fits the SA team. Edit: I've added Sparx to this AA since Tomo made a chat DM with all 4 of us Sparx became fully aware of the situation and agreed to the biased decision that was taken to keep me banned. So I feel since he didn't do anything about it he is as guilty as the 2 other SA's. This AA has been collecting dust for over 3 months now. This is so ridiculous. There has been no response from the accused staff members neither has it been concluded, in over 5 months now.